Not too long ago, nearly everyone around here raised up at least one or two butcher hogs each year for their own table. 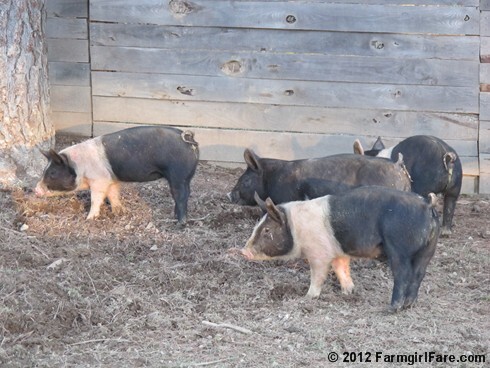 There used to be plenty of local hog farmers around as well, so inexpensive young feeder pigs were easy to come by. 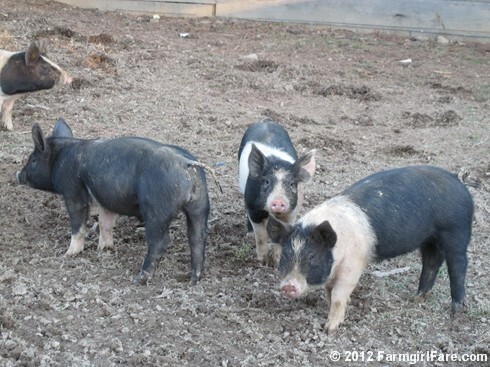 Hogs grow fairly quickly, don't require a lot of acreage, and provide plenty of meat. They'll also eat all sorts of kitchen and garden scraps. The locally raised butcher hog we had custom processed last December weighed 260 pounds and dressed out at 185 pounds. Just like with our grass-fed lamb, the amount of meat you take home is a little less and depends on the cuts you choose. That's a lot of bacon—and ham and chops and sausage and hocks and pork steaks. We had an amazingly flavorful pork roast for dinner a few nights ago, seasoned with nothing but salt and pepper. The bacon, which we have smoked but not cured—so as to avoid adding nitrates—makes the best BLTs. Sadly, most of the hog farmers—including my hunky farmguy Joe, who bred and raised hogs for the first 7 years he lived on this farm—have been put out of business, mostly due to sky high feed prices and rock bottom hog prices, courtesy of big agribusiness corporations. But some of us refuse to trade in our flavorful, homegrown pork for meat that comes from animals who have been raised in horrid, inhumane CAFO conditions, and thankfully a few hardy locals still raise hogs. For years we've been buying our pork from a guy who fattens up a few dozen butcher hogs each year, supplementing their feed with milk from his dairy cows, which makes the meat extra tender. Hogs and dairy cows often go hand in hand on a small farm. You know that ten member family that supplies us with fresh raw milk each week—the ones with the darling baby calf? They also eat a lot of pork along with all the milk they drink. While walking back from admiring the new calf, I asked the young milk maid if they still had any hogs. She said they'd just butchered all three themselves, right there on the farm, including a 700-pound, 9-foot long sow. That's a big job—which provided this hardworking farm family with plenty of good meat to eat. 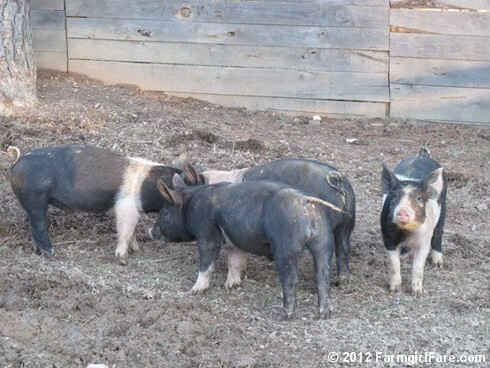 Now they were already makin' more bacon, with these happy young pigs they'd recently purchased from one of our Amish neighbors. Even when the freezers and larders are full, you always need to be planning ahead. Looking to eat local? LocalHarvest.org is a great resource for finding naturally raised meat, vegetables, and other foods grown close to home. 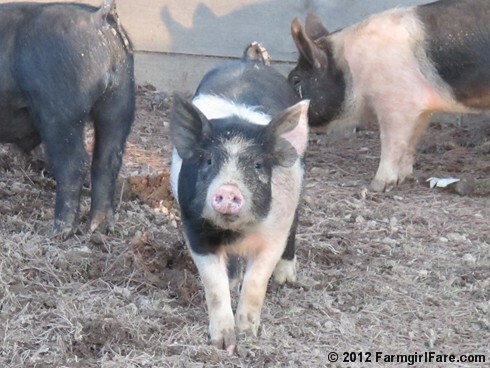 © FarmgirlFare.com, hamming it up a little during lambing season. We do the same thing with either a 1/2 hog or 1/4 beef each year. The first year we split a hog from a local farmer with my in-laws and had it butchered locally. Last year we just bought a package deal of a mix of beef and pork from the same local butcher. They get all the animals they butcher from local farmers so we get good meat from nearby at a good price. So much better than buying all our meat from the grocery store. My husband and I bought a pig from a co-worker. His daughter raised the pig for 4-H. We split the chops and ham among some family members but we kept ALL of the bacon. Dee-lish! 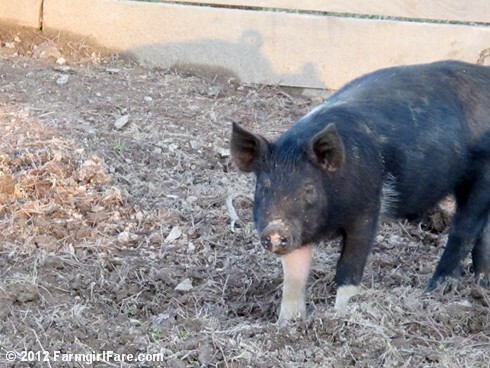 We're hoping to raise two shoats on our new homestead in 2013. Our land hasn't been farmed in 20+ years, and I've been told we have very lush, overgrown pastures that pigs will love. We plan to not buy commercial feed and raise them on just pasture in small, rotated paddocks, with chestnuts and apples from mature trees on our land, expired dairy from local sources, kitchen scraps, and extra eggs from our hens. It should be interesting! That's the way everyone should be living these days. I sure would like to! I buy organic local whenever it's available. Woooooo! Pig! Soooie!!!! LOL...Bet you would never guess I'm from Arkansas and a Razorback fan!!! I love me some hogs!!! Neat photos...pigs are so funny to watch! I head for the pig pens every year at the County Fair! You have a lovely blog, but you're not telling the whole story here. Where are the slaughter photos? If you're going to blog about raising these "darn cute", "funny to watch" "gorgeous piggies" for killing and eating, shouldn't you document the entire process? Pretty sure she wasn't there for the slaughter. I mean, that's what I took away from, "they'd just butchered all three right there on the farm, including a 700-pound, 9-foot long sow." So, it's not like she was there watching it and just decided to take photos of the cute ambling pigs you see on the post. Not to mention the many other times on the blog where she's said that she doesn't talk about every single thing that goes on in farm life. There's a finite number of hours in the day and if she's going to take a few minutes away from busy farm life to share some stuff with the world through the blog, I'm thinking that focusing that time on cute sheep, gardening, making hay and getting bitten by a Copperhead is plenty good. Meanwhile, "Anonymous", I find it amusing that you're getting on Farmgirl's case for being less than 100% transparent. If you want to see the intricate details that go into slaughtering animals, there's lots of Internet out there. 2,860 results come up on YouTube for "How to slaughter a pig." Enjoy. Hi FinnyKnits. I knew the "anonymous" posting was wrong as soon as I hit the button. I actually have my own blog over at "kindtobekind.com" (which I, embarrassingly, haven't updated in a little while!) and am on a journey to become vegan. I've read quite a lot on the subject (and have seen the videos) and, being an animal lover, it's the choice for me. I certainly am not attempting to cast judgment here. I've visited this blog from time to time in the past and think the photos of the animals and their babies are heartwarming. They are obviously lovingly cared for. I stopped visiting Farmgirl Fare because I cannot flip from the loveliness of an animal on one hand to the deliciousness of that same animal on another. I arrived here today because a friend of mine, who visits this site regularly, had linked me to this post because she also found it disturbing. It just breaks my heart to hear people essentially say: 'look at those cute animals...mmm bacon!'. Like animals are put here for our amusement and for the luxury of a moment of flavour in our mouths. I just wish more animal-loving individuals could see what really happens at the very end of a meat-producing animal's life, no matter how lovely their upbringing. I'm very sorry if I offended anyone here. I realize people who visit this blog do care about animals. I have farmers in my family who struggle with this concept, too, so thought I would post my thoughts. I'm with Kat regarding this post. I still enjoy Farmgirl Fare - the non-meat recipes are amazing, the writing is entertaining, and the pics are adorable - but all I could think of was that little pig's eyes as he or she looked at the camera while the captions talked about how yummy the pigs would be to eat. I totally get it, by the way. My boyfriend hunts and grew up helping his grandparents on their pig farm, so I've heard the stories. And I respect people who produce their own meat, either via hunting or raising food animals themselves. Their choices are far more worthy of respect than those of the many people who say, "Oh, I could never kill an animal myself. Pass the pork chops!" And it's patently obvious that all of the animals mentioned on this blog are raised lovingly so they have good lives. I just wish that the writing in this post might have reflected a little bit of regret that these lovely, smart creatures were destined for the chopping block. My hubby would luv to raise his own, they did it when he was growing up. I told him he'd have to keep them somewhere so I could not see them. Everytime I tell him I want a pet pig...he says "bacon, bacon, bacon". I tell him never mind. I have GOT to figure out how to get a split half pig into my chest freezer. With the split half of beef we have in there from our local ranch, I'm not sure where to put it, but MAN, would we love to get some of that into the smoker. Meanwhile, yes, they are quite cute. You guys thinking of getting hogs any time? Well, I waaaaas going to say what darn cute pics of pigs you took (and you know how I love pigs) but at the risk of inciting the moral minority, I'm saying no more. Which is pretty, pretty, pretty hard for me. Well I mean, honestly.....the clue's in the title "Farm" girl fare. I was a vegetarian for 30 years, now eat meat on occasion. I come from a family of animal lovers and love the Farmgirl website for all the animal cuteness. But the dichotomy you all feel looking at these photos are what farmers face everyday! I'm sure it is really hard for them too, but they have to make a living! And I would far far rather eat one of Farmgirl's lovingly raised lambs, who has known kindness, good care and good food its whole life, as opposed to a lamb from an anonymous big public operation (or from NZ or Aus, no offense, but that isn't eating local at all and just seems stupid). Of course it is hard to look at cute farm animals knowing they are going to be food, but that is reality. Just thank goodness there are sensitive caring farmers out there like Farmgirl and her neighbors who treat the business with love.